Mike Smith of Inverness BID at the Black carpark in Rose Street, Inverness. A Stornoway businessman has revealed proposals to build a new global brand hotel in the heart of Inverness. 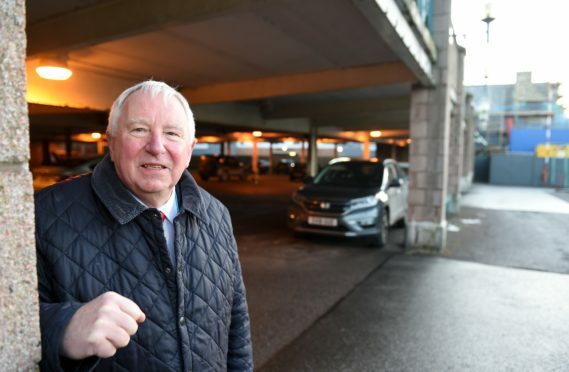 Stewart Campbell of SRP Inverness Ltd wants to pull down the two-storey open air car park in Rose Street and replace it with the hotel, landscaping and parking for around 30 vehicles. Mr Campbell has also bought over the block containing the Highland Backpacker’s Hostel, and the former Rose Street drill hall. The hostel is leased and will continue to run as usual, Mr Campbell said. The rest of the space would be refurbished for retail or office use after the hotel is built. Mr Campbell said Inverness has always had a fond place in his heart. Nowadays Mr Campbell’s horizons are global, after 15 years managing and investing in international hotel brands like Holiday Inn Express and Ramada Encore. He currently has interests in the Moorfield Hotel, in Brae, Shetland and the Aberdeen Altens Hotel. He’s also invested in the Travelodge in Inverness city centre, yards from his proposed new hotel. Mr Campbell said it was too early to say which brand would be moving in, and detailed plans for the hotel would be drawn up according to the brand’s requirements. If all goes well with the planning process, Mr Campbell said he hoped to see his hotel on the ground by the end of this year. His proposals were described as ‘hugely significant and very exciting’ by Inverness BID manager Mike Smith. He said the site has had a long planning history with previous proposals to use it for student and office accommodation not materialising, but the hotel concept was to be welcomed. A key aspect of Mr Campbell’s vision is to include a bus lane rerouting buses and taxis away from Academy Street. Inverness Central councillor Richard Laird said: “This is a pre-application notice, so details are sketchy. “I think it’s well-established that demand for hotel accommodation in the city is high, so I’m not surprised there is an application for one on this site.